There’s been a lot of spinning talk around here lately, and since I’ve been getting more spinning done, it’s time I used more of my handspun up. 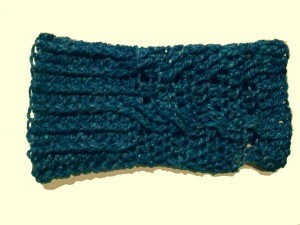 This yarn called for texture, so I chose cables, and it is easy to adjust the sizing. Not a spinner? Don’t worry! While the pattern was written for my handspun, it will work for any comparable solid-colored or semisolid yarn–handspun or commercial. Gauge Swatch: 2’’w x 2’’h (5 cm x 5 cm) ch 10. This entry was posted on Friday, February 19th, 2016 at 12:00 AM by Candace	and is filed under Free Crochet Patterns. You can follow any responses to this entry through the RSS 2.0 feed. You can skip to the end and leave a response. Pinging is currently not allowed. I tried 7 times but the feather cables are not symmetric. I don’t know which is the stitch when perform FPTR. Could you please help me figure stitch out? Which cable are you having trouble with? They’re both worked over 4 stitches. It looks like some commas may have been misplaced with editing. I’ve updated the cable directions to better reflect the original. I hope that helps.